Fess up! You thought I was going to show you how to crochet a big, burly guy, right? But, no. It’s the hat that we’ll call Spike. 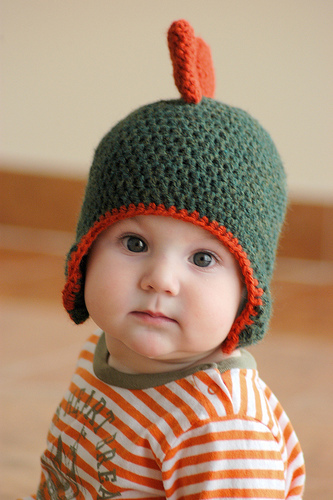 I know it’s hard to get past the adorable toddler, but – really – do look at his cute cap. Reminds me of a Stegosaurus, a favorite of my boys when they were in that dinosaur-loving age group. 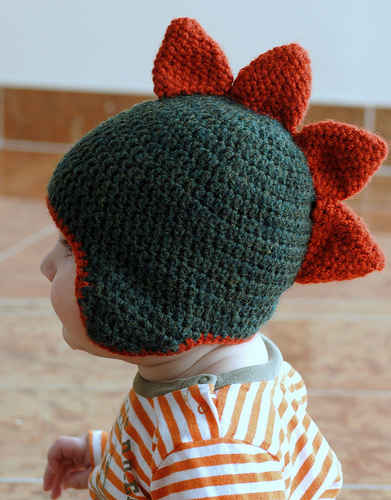 This designer has taken a simple cap pattern and made it her own by adding the spikes for which she gives us her pattern. What little boy (or tomboy) wouldn’t like this? Here’s where you can get the free pattern for the spikes. Enjoy making those. Would love to see some in pink! OMGosh this is so cute!! I want a little boy so badly! !